Why choose a smart garden? Oasis delivers the most accessible gardening experience for anyone from chefs to families to schools, taking less than 45 minutes a month to tend to! Seasonal plants, weeding, watering, and pest control are all things of the past! Oasis is here to help you grow. Bring a full indoor garden to your home. Aeroasis is developing plant climate presets for almost every culinary plant you can think of (and some you haven’t!). Oasis automates everything from light cycle, temperature, humidity, plant nutrient uptake, and acidity levels - keeping your plants happy year round! With Oasis, you can keep on growing right through the winter months. Take the guesswork and climate constraints out of gardening forever. Seasonal gardens are a thing of the past! After every harvest with Oasis easily download and share time-lapses of your grow to your friends and social media accounts! They wont believe how much food you grew! 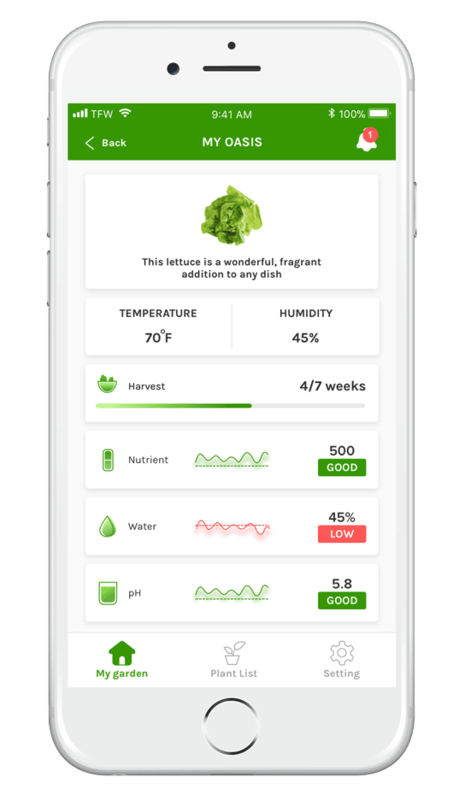 Control, monitor, and learn about your plants as you become a future farmer! The Aeroasis App will be available from the Apple App and Google Play Stores. What growing with Oasis means for you?